In your adventures in the world of Alyria, you will obtain items of varying desirability and value. Items can be won through combat, purchased at auction, bought in a shop, given by an NPC as a reward for a quest, or simply stumbled over during your explorations. There are many different basic types of items. These may range from treasures, artifacts, and jewelry, to mundane items such as lockpicks or water container. Additionally, there may be different subtypes - for example, you might have a brown leather water flask, or a metal canteen. Both would be water containers, but they are clearly different subtypes of water containers. The most common method of obtaining an item is by GETting it. GET allows you to pick an object up from the ground or from inside a container, such as a chest or a bag. Be careful when picking up an unknown item, however; if the item is cursed with evil magic, you might not be able to let go of it. You can also GET items from a container (for example: GET TORCH BAG (the "from" is implied)). A container is a special type of item that can hold other items. Once you have an item, you can choose to PUT it somewhere if you wish. Items can only be PUT in containers. In situations where there are duplicate items (items with the same names) in the same container or in the same room, you may reference a specific item by putting a number and a period before its name (for example: GET 5.TORCH BAG or PUT 3.AMULET BAG). You may choose to WEAR (or equip, or hold - they're all synonyms for the same thing) the item. This is how you would wear a cloak (which helps protect you), or wield a sword (which you can use to fight a creature). You can view items that you have equipped with the EQUIPMENT (eq) command. Equipped items may be removed with the REMOVE command. Equipped items are worn on body parts. Your character is comprised of several body parts. While the parts may not all be called by the same names in all races, they can be classified with the following titles: head, torso, arms, legs, wings, and tail. Not all races will have the same bodyparts, the same number of each bodypart, or even the same name for each bodypart. A large animated plant might have a trunk (instead of a torso) and psudopods (instead of arms). Dracons have tails and Feys and Sidhe have wings, whereas humans do not. Through use of the EQUIPMENT (eq) command, you can see a list of what you are wearing on each body location, and a list of the body parts present on your character, with the armor resistance listed for each body part. If the item is of a certain type and you can hold it in your hands, you may choose to USE it. Items such as scrolls, wands, orbs, or potions may be USEd, among others. If you wish to give an item to another character, be they NPC or PC, you may GIVE it to them. (Example: GIVE CLOAK ORC). When you decide you no longer want an item, you may DROP it. This puts the item in the room before you, where it may be picked up by other characters. Be careful not to drop items in the ocean or aboard a ship, as most items do not float and will sink into the water. Similarly, do not drop your items in lava unless you really don't want them anymore. When your character is created, you will have a set of basic equipment that will get you started. But you should also take the time to investigate shops for helpful gear that can boost attributes or stats as well as finding weapons that hit harder and armor that protects better. Some helpful equipment can also be earned by performing special tasks. You will see basic information about an item simply by LOOKing at it. If you wish to see additional information about an item, you will either need the Lore proficiency, the Identify spell, or a spell scroll containing the Identify spell. Item 'a phoenix feather quill' is type writing-instrument, alignment 500, made of organic, has keywords 'quill phoenix feather'. This item weighs 0 stones and 4 pebbles, and is valued at 1,125 gp. This level 45 item has the attributes: identified nodrop permanent will-float A phoenix feather quill is in excellent condition. There are about 1 ounces of ink remaining. *This item may be repaired 6 times. This quill has been crafted from a large, red, phoenix feather that seems to flow through shades of red as if it were a flame. Despite its fiery appearance, the feather is cool to the touch and is not giving off any heat. The quill appears to have been enchanted to provide an endless amount of red-tinted ink, for use in writing letters and books. In this example, the attributes of the item are identified as "identified permanent wont-fuse will-float no-steal". You can find out more information as to the meaning of each attribute in ITEM ATTRIBUTES. 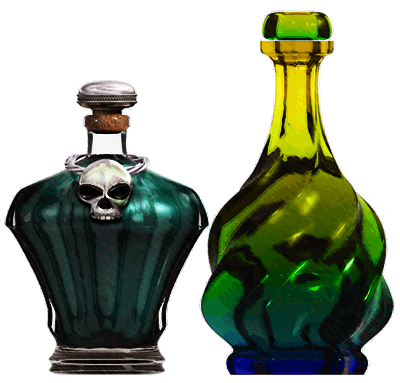 Due to the powerful nature of magic in the world of Alyria, Adventurers will often come across enchanted items - these can be as simple as a shield that enhances the Adventurer's Vitality or as complex as a rare artifact, such as the Skull of Riga, which among other things, bestows mental-spell resistance, increased vital attributes, and invisibility detection upon its bearer. Through your travels you will come across many merchants seeking to sell you goods and services, or buy goods from you. These are called SHOPS. You can buy many different types of goods and services from shopkeepers, such as weapons, magical spells, horses, pets, etc. Shops usually only have a limited amount of inventory on hand. Once that inventory is depleted, you must wait until the shopkeeper replenishes his or her supply. Depending on the item, this can take days, weeks, or months. Usually the more exotic the item, the less the shopkeeper will have in stock, and the longer it takes him or her to acquire more. Shopkeepers will be denoted by the yellow [Shop] tag before their name in a room. When you find a shopkeeper, you may type SHOP LIST to see his inventory. SHOP IDENTIFY will show you more information about that particular item, and you can buy an item by using SHOP BUY . If you wish to sell an item, you can try SHOP SELL <item name>. The shopkeeper may not always want what you are selling, or need to get rid of his current inventory that particular item before buying more. PCs (and PC Clans) can also lease and stock their own shops. These shops are located in an area known as the Alyrian Bazaar, which is nestled between the townes of Lowangen and New Rigel on the continent of Sepharia. You may find interesting and rare goods in these shops, but expect to pay a hefty price! Sometimes items will be hidden from sight. To find hidden items and doors, you will need to use the SEARCH command. To uncover items that are buried, you need to use the DIG command. To DIG, you need a spade and a pickaxe from a store. You can also BURY items you find, so you can use them later. Keep in mind though that other players may find the items you bury (as you may find theirs).